FreshGrade, a leading portfolio and assessment platform, offers an extensive library of eBooks on pedagogical concepts for schools and districts. To boost company visibility and acquire new leads, CB&A developed Facebook and Twitter advertising campaigns that included ad copy, targeting and optimization to drive eBook downloads from FreshGrade’s target sales audience in five key states. 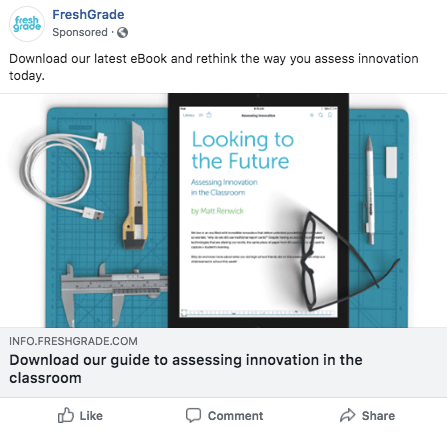 The paid social media campaign on Facebook and Twitter led to 136 eBook downloads by educators and administrators in key sales states, helping FreshGrade grow its U.S. presence with new leads and increased brand awareness.